One of the many reasons that companies choose to automate some of their systems is to reduce human error and ensure a consistent quality of product. Whilst it might seem surprising to think of that same logic being applied to the training of racehorses, that’s exactly what’s been implemented at one racehorse stud in the Lambourn, an area of the UK famous for racing. Racehorses traditionally start their careers at an exceptionally young age – with thoroughbreds destined for flat racing often beginning their training at just one year old. A major problem with this is that at this age, a horse’s skeleton is simply not ready for the rigours of training at high speed under saddle. The growth plates within a horse’s bones close at various ages – with the vertebrae not fully closing until an age of between five and eight – by which time many racehorses have already retired from racing and are sometimes destined for an uncertain future. So, why do racehorses begin their careers so young? One reason is simply a question of money. 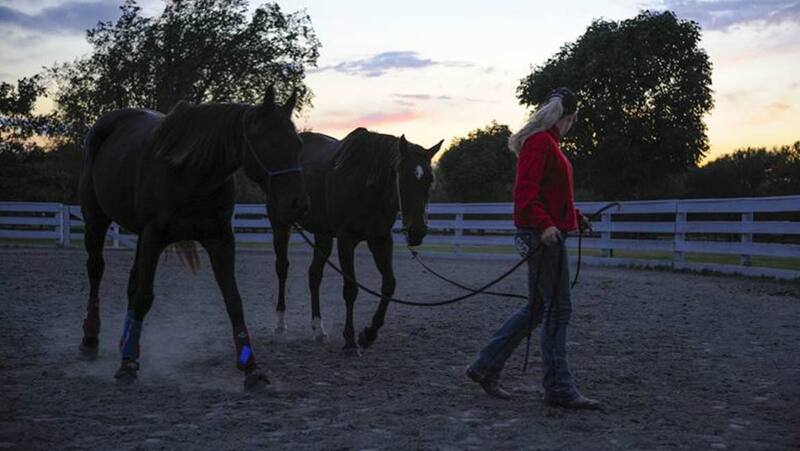 Keeping and training a horse is a costly business and the younger a horse starts, the sooner it can be determined if it will be successful on the racetrack or not. So, assuming that the racing industry is not going to break from this tradition of starting horses so young, what can be done to protect these animals as much as possible? One racehorse owner thinks he has the answer, and has spent more than £20 million developing a pre-training system which looks rather more like it belongs at a theme park than a yard. The Kurtsystem has been designed by rollercoaster engineers, and it certainly shows. At the Kingwood stud, a surprising addition sits above the standard 1.5 km long oval training track. A covered monorail has been installed, which contains ten individual cabins, situated in pairs, one each side of the central rail. Horses are secured within a cabin, and then begin a predetermined exercise program that depends on their age and level of fitness. Once the system starts up, the horses certainly look comfortable carrying out their exercise. With many racehorses being used to mechanical ‘horse walkers’ which exercise multiple horses on a small circular track, this new system is probably not so different for them. Despite this, some trainers have expressed concerns over what would happen if a horse lost its footing during exercise on the Kurtsystem, and it’s a valid question. It is something that seems to have been taken into consideration when designing this new machine. In between each pair of cabins is a seat for a groom, who can monitor the comfort of each horse and bring the machine to a stop if necessary. The driver’s cabin is located at the back of the monorail, and allows for precise monitoring of speed and effort of each horse through sensors placed on the horse’s backs. Kurtsystems say that during operation to date, there hasn’t been any accidents. The main intention behind this system is that the initial strengthening work of young horses can be completed without a rider on board. Part of the logic behind this is to reduce human error, providing a consistent training plan. The other aim is to design an exercise regime to best suit both the musculoskeletal and psychological development of young horses. The other reason is to reduce the stresses and strains placed on the horses, and slowly build up the amount of weight that they carry over a longer period of time. The Kurtsystems website suggests that at the end of the six-month pre-training plan, they expect the horses to have developed in a balanced way – with emphasis placed on both the musculoskeletal system and psychological development of a young horse. All this means that they should enter the next, ridden phase of their training with both the confidence and physical ability to potentially become world class racehorses.